We don’t like to think about it, but the reality is: hardware breaks, buildings flood, and hackers do bad things. If you were suddenly unable to access any of your business data — customer account information, payroll, accounts receivable, emails, work documents — how long would it take for you to recover? A day? A week? A year? Digital West uses the most sophisticated software available to manage backups of your desktops, laptops, file servers, as well as Exchange, SQL and other complex databases. We reduce the technical and logistical obstacles associated with traditional backup processes and provide you with a cloud-based restore solution that’s both cutting edge and easy to use. Businesses who didn’t start backing up until they had a hard drive failure. Your data is compressed and deduped at your site to save you valuable time in backing up the data. Once the initial backups are completed, we automatically and securely do incremental backups over the Internet, protect your data by storing it offsite, then restore it as you need it. 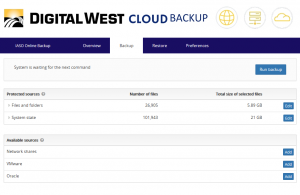 Digital West’s Remote Backup Service provides simple, web-based management and reporting. Digital West’s cloud backup solution is suitable for every business, from a single person office to a network of hundreds or thousands of servers, desktops and laptops. Service is priced by the stored Gigabyte after data has been de-duplicated and compressed, creating an average savings to you of 40%. When backup alone isn’t enough, Digital West can build you custom Disaster Recovery solutions. Just ask! Sign Up with Digital West to get started. 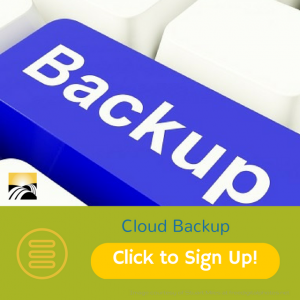 After signing up, you’ll receive a link to download the backup software. Select what data you want to backup. Decide how often you want a backup performed. Your data is backed up remotely to our data center.